It’s all going downhill for Sri Lanka as they have lost 7 matches on the trot in the limited-overs leg of the South African tour. Now, it’s time for the one last game of the series. The Wanderers, Johannesburg will host the 3rd T20 of the series on Sunday. Keep reading to find out South Africa vs Sri Lanka 3rd T20 Match Prediction. The last game of the series is going be inconsequential in the context of the result. South Africa has already won the 2 games and has and an unassailable lead. They now have the opportunity to inflict a clean sweep. On the other hand, Sri Lanka would play for pride. For the visitors, it was a great opportunity to strike a win in the last game as the hosts were without the key players. But the change in personnel didn’t change the result. 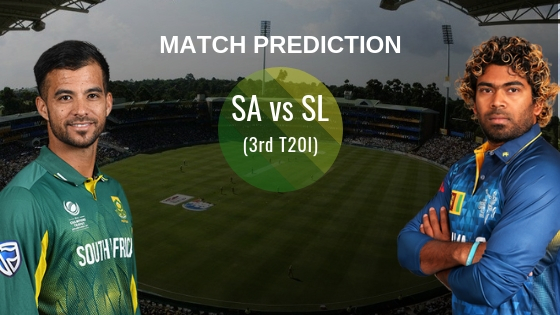 South Africa vs Sri Lanka 3rd T20 Match Prediction: Going by the current form of Sri Lanka in white ball cricket, it seems difficult how they will win a match. It’s highly improbable that they would board the flight back home with a victory under their belt.